Conference venue was easy to find from my hotel, it was a building with nice clean lines and staff was very helpful. Coffee was nice and strong, despite coming from Nespresso machine. Book of use cases and a nice notebook with some tips of places to see in Barcelona. Great fun welcoming talk from Josh Holmes @joshholmes, including raising the near fire alarm (none visible inside auditorium), no tweets and no selfies with firemen and/or fire before the fire is completely out. Designing something nice in photoshop is easy. Designing something that solves the business problem, gets through the multiple stakeholders, looks nice and eventually launches is a lot harder. Haraldur is from Iceland and he says that most people there are generalists, not specialists. There’s usually a small team and one man does-it-all is the designer. Create your own wireframes (they use a ‘flat design turned gray’ to communicate and build trust and work on concepts and ideas) – showed sample for Dropbox user/admin guide. Amaze your friends, confound your enemies! Oh, and save bandwidth and speed up your site by sending the correctly-sized images for the device with HTML’s new responsive images capabilities. Bruce proposed the new <picture> element in 2011, and it’s just gone live in Opera, Chrome and Firefox, so learn all about it now and put the techniques live tomorrow. <picture> tag and attributes Images are big and getting bigger, and not responsive properly. 3 years ago, retina images would be served no matter what, now you can serve the correct image size for each device. Different widths but showing with the size of 100% of the viewport. Order of the media queries matters, the first to satisfy the requirements ‘wins’. You need the <img> as last option of the <picture> to carry on with fallback to other browsers. Exploring the world of side projects and particularly why I believe side projects are stupid. The talk will bring light into this mystery. Tobias mentioned that side projects have to follow the KISS principle. Soundslike festival 2010 – open air festival – learning curve, not knowing about the process and all that was required. His favourite project was Reflections, photographing reflections of these square glass objects and making artwork/prints/postcards. Playing with elements/objects and being creative without actually having an initial goal. Semplice – Semplice is the first fully responsive case study portfolio system based on WordPress. Built by designers’, for designers’. As designers we spend most of our time toiling over the graphic design principles we need to master, or the best way to create progressively enhanced sites. These skills are vital to our success, and worthy of our attention. But there are other things to think about that are just as integral to the quality of our work. What larger role does design play in an organization, and how do we shape it? What kind of culture should we foster within our teams? How do we choose where (or if) we focus our efforts, and how does the focus of our work affect the development of our skill set? In this talk we’ll step away from the keyboard and explore the interpersonal side of design. User on center of design process is well known but we fail to include the user quite often. Excuses: “User research belongs to someone else”, “I don’t now where to begin”, “It may raise inconvenient questions”, “It’s expensive and time consuming”. Getting to know the user doesn’t have to be hard. Analytics gives insights on what is happening but not WHY. Listen to what your users are already telling you. Keep yourself reachable, create more personal emails (don’t need branding), asking what the users expect, what they will use the tool for, etc. Example/suggestion on being in touch with the customer: 15 min spending on random support tickets every morning, get notifications for tweets people send to the organisation, ask sales rep to listen in on a call once a week. Responsive Web Design done correctly is based upon content rather than actual device resolutions, and so typography should adapt to both layout and sizing across content breakpoints. However, mere font sizing along the typographic scale based upon two-dimensional viewport @media queries is not enough. Apart from setting the correct balance of the black and the white in letterforms and texts, there are other important factors such as reading distance, information density, screen sharpness and device orientation that also influence the reading process. Learn to look at typography multidimensionally and enhance the overall responsive experience. Pantographia – accurate copies of all the known alphabets in the world! 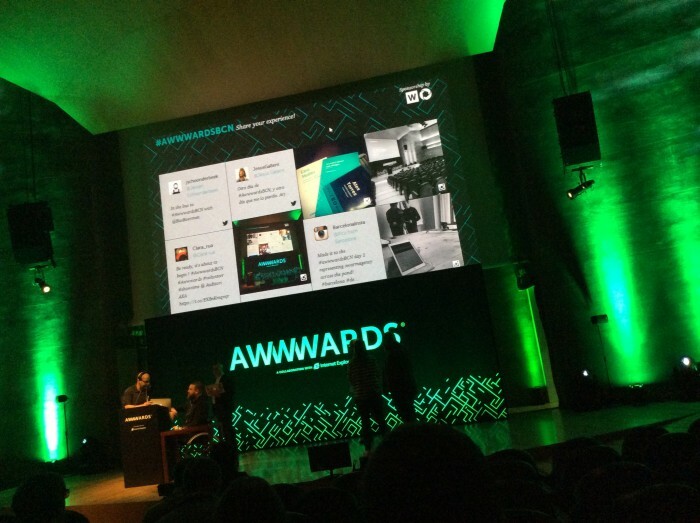 All his slides are at: https://speakerdeck.com/maratz and the Awwwards Barcelona slides too. The Web’s open nature has fostered ways of working which accelerate learning and innovation to an amazing rate. How do we keep up? How do we protect this asset for the future and can it compete with the fashionable application marketplace? This talk will explore these themes and attempt to answer those questions by looking at case studies, examples and concepts from past and present. Phil works on R/GA (London) started as ad agency now they produce ‘other stuff’. The Ted Nelson words (and his attempt at using them on the presentation) – hypermedia, hypertext, transclusion, intertwingularity, teledildonics, etc. Fashion and trends…. yes, trends appear and disappear. Standards and conventions versus trends. Much more important now: accessible, stick to the principles you know to be true, resisting ‘the man’. Paul is currently working on many design-specific features with the ultimate goal to make DevTools a tool for designers, as much as for developers. Come by for a sneak preview of crazy new things, such as improved responsive design controls, rich live editing of animations and more and more fun with colors. Paul gave various examples of new features coming up (and some already in place) on the dev tools. DevTools for designers for today – eye dropper can pick colour hovering on the page, with a few steps it will allow editing css/less/sass files straight from browser, the inspector shows exactly which font is being rendered. Live editing in Dev tools, go to settings: workspaces – add the folder and allow editing (when question comes up), and in sources tab on browser you can map to file system resource (double check docs later). Other amazing features: Animations tab to control animation speed. Cubic bezier editor showing onion skin previewing how it will look. Everything we talk about is inspired by the stories that frame our personal and working lives. There are seemingly few other experiences outside of those two contexts. What we have learnt – after all these years! – is that each story does matter. Every single story, from the smallest anecdote to the most profound tale, can become utterly unique and unequalled. What matters most is how you tell a story. We would like to tell you something of the diverse stories and experiences that have shaped who we are, and what we believe in. Let’s do that by discussing creativity. Creativity is a force that can change everything, turning all it touches into a work of art. It is a universal language that makes dreams come true. Stories allow us to be creative, be happy. Apparecchiato – a tomato story – local food and ecomerce (buy fresh local and good food). Diumbo – an elephant story – app to meet people, approaches only ‘closer’ people to you so you can meet personally using only wifi triangulation. C-fax / teletext – Vitaly getting embarassed explaining how it works to the audience. They also use a styleguide and boiler patterns on Drive just showing where they can shortcut depending on the type of components used for each project. slightly better linear workflow -> content . ux . design . front-end . back-end . launch! Ask the customer to prioritise instead of asking what it is important (after all, everything is important for the customer). Update (09/03/2015) – check my notes on Day 2.